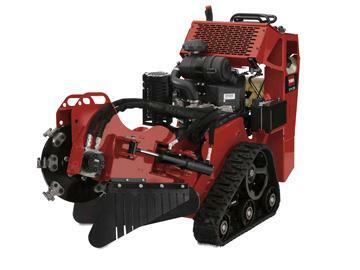 Toro STX compact track driven hydralic stump grinder. Easy to use 2 lever control to hydralically driven cutting head eliminates belt slipping or breaking for greater productivity. The tracks provide a low center of gravity and travel easily over wet or uneven ground. * Please call us for any questions on our stump grinder dingo stx 26 hyd prop rentals in Portland OR, Gresham OR, Milwaukee OR, and surrounding metro area.